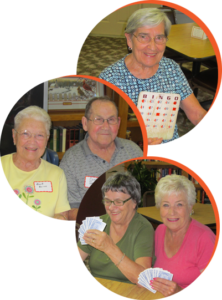 Community Center features a large social area where residents get together for card games, book club, faith sharing/Bible study, and Ladie’s Day. Seasonal parties are also held. Laundry facilities are available in the Community Center. Pets are allowed in selected cottages–please ask about availability. Raised-bed garden plots are available each spring for those residents interested in gardening. All cottages have wide doorways to accommodate wheelchairs and walkers, and all bathrooms have handrails in the shower. In addition, we have specifically-designed handicap accessible units in each building with features such as lower countertops, higher toilets and attached garages. We are family owned and operated with on-site office and maintenance staff. Take a tour and see the difference we offer at CVH!